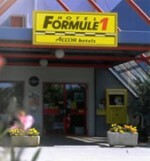 The F1 Hotel is part of a large chain of basic hotels in France that offer extremely affordable and practical accommodation. Room types consist of two single beds or one large bed and one single bunk bed above. The rooms have a basin; private toilet and shower facilities are available on each corridor. Rooms are not air-conditioned. The F1 Le Mans North hotel is located within the area of Le Mans St Saturnin. There are a good number of restaurants, shops and supermarkets close by. The hotel has excellent, secure car parking and free WiFi. Breakfast is included in the package price. The hotel is approximately 5 miles from the centre of Le Mans and approximately 8 miles from the circuit.